Lightwaves Radio, Mangle Music Radio and T-Radio London, Welcome back Host Wendy Adams on INNER CIRCLE!! Wendy is counting on her millions of listeners to tune in and help spread the word about Financial abuse. It needs to be stopped! She is also asking for more Civil, & Criminal Attorneys along with one more Forensic Accountant to step up! 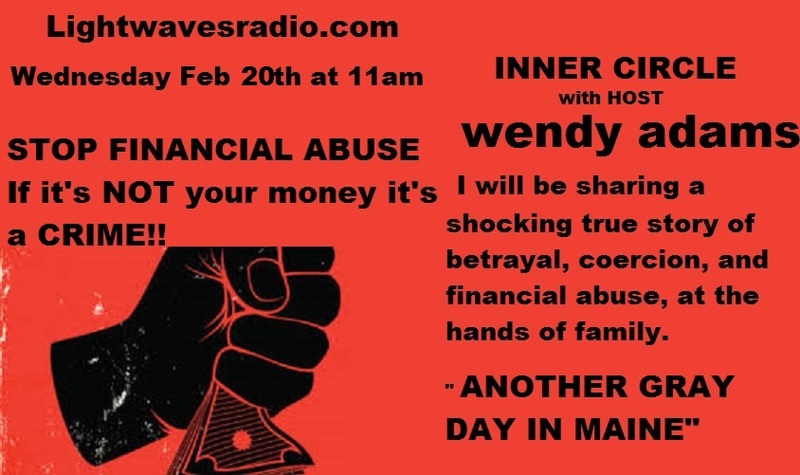 Join us for the Amazing true story of Financial Abuse, and as many of you know Inner Circle is the format Wendy uses to expose true evil. This time it’s Financial Abuse, through Coercion, Betrayal, Abuse, Exploitation all at the hands of family members. “Another Gray Day in Maine”. Join us Wednesday February 20th at 11am MST. « Lightwaves Radio, Mangled Radio & T-Radio London U.K Present “THE WENDY ADAMS SHOW”, “MUSIC TO MANGLE YOUR MIND ” & “NIGHTMARES” Returns LIVE TODAY Join us at 12 pm EST For 3 Shows in a Row! !